When I started researching Novara I read somewhere that Attilio Tesser was the longest-serving manager in Serie A. I was shocked. The guy’s only been with his current employers since June 2009, I thought, surely there are at least 3 or 4 other Serie A managers who’ve been incumbent longer than two years?. I already knew that Italian clubs (in the top tier, at least) weren’t exactly known for managerial longevity, but this seemed ridiculous. Two years! Really?! Yes, really. The current longest-serving Serie A manager has only been with his club since 2009. Sadly, this manager isn’t Attilio Tesser. Further research told me that Luigi De Canio (a man I remember from his stint as Queens Park Rangers manager) has been at Lecce since March 2009, beating Tesser by three months. Boo hiss. Still, it’s pretty amazing that Serie A’s two longest-serving managers have only been incumbent since 2009. Ten Serie A teams started the season with new managers, so maybe I shouldn’t have been that surprised, but it was pretty shocking to somebody like me. I’m used to Sir Alex Ferguson and Arsene Wenger, but Italian coaches are lucky if they get two years of employment. What is this madness?! Discovering that De Canio had been at Lecce for longer than Tesser had been at Novara took a bit of gloss off the Biancoazzurri coach, but I still felt compelled to research his career. Here’s what I’ve found with the resources available to me. Tesser’s playing career lasted from 1974 to 1991. Starting his career with Calcio Montebelluna (where he stayed for four years), Tesser would play for Treviso and Napoli before signing for Udinese in 1980. This was unquestionably the most productive spell of his playing career. In five seasons Tesser, a defender, notched-up over a hundred appearances for the Zebrette, scoring six goals in the process. His time in Udine came to an end in 1985, and Tesser played for (then) lower-league sides Perugia, Catania and Trento before retiring in 1991. During his playing career Tesser earned 5 Italian under-21 caps but never really threatened to break into the senior side. Sadly, this is all I’ve been able to find-out about Tesser’s playing career other than a handful of appearance stats. Tesser’s coaching career started in 1992 when he was appointed manager of Serie D’s Sevegliano. Sevegliano were then what they are today: a tiny, amateur side that don’t really stick-out among the myriad of provincial sides that populate Italian football’s lower tiers. Still, Sevegliano gave Tesser the opportunity to cut his managerial teeth. I’ve always thought it beneficial for young managers to start plying their trade at smaller clubs away from the spotlight. Working in such a low-pressure environment would’ve given Tesser a chance to master the craft and learn from his mistakes. In 1994 Tesser left Sevegliano to rejoin former club Udinese as a youth coach. He worked with Udinese’s youngsters for two years before joining Venezia in a similar capacity. After seven years as a youth coach Tesser decided that the time to move into professional management had come, and he signed his first full-time managerial contract with F.C. Sudtirol-Alto Adige in 2001. He stayed with the Serie C2 side for two seasons, guiding them to 4th in 2001-02 and 3rd in 2002-03. Suditrol made the Serie C2 group play-off final in both of these seasons, but fell to Brescello the first time round and Tesser’s current employer’s Novara the second. In summer 2003 it was time to move-on. Serie B side Triestina had taken note of Suditrol’s good performances under Tesser and decided to take him to the Stadio Nereo Rocco. Sadly, Tesser didn’t fare quite as well with Triestina. The club had finished 5th the season before Tesser’s appointment, but Teser could only guide them to 10th in his first season in-charge. Tesser’s second Triestina season was dismal. Finishing 19th in Serie B, Triestina found themselves in a relegation play-off with Vicenza. Tesser’s squad won the play-off (although the result was made irrelevant in the wake of a match-fixing scandal involving champions Genoa (another story for another day)), but the coach left at the end of the season. Triestina’s struggles under Tesser weren’t exactly his fault and it’s unfair to describe his time with the club as a complete failure. I’ve learned that the board sold most of the squad’s key players from under Tesser’s hands, and the squad that started the 2004-05 season barely resembled that which he assumed he was taking over. On the surface it looks like Tesser was severely undermined at Triestina, but such is life in the trenches. Cagliari handed Tesser his first Serie A job in 2006. At that point it was by far the biggest break of Tesser’s managerial career, but it would also be the shortest. Chairman Massimo Cellino sacked Tesser after just one match, a 2-1 loss to Siena. Sadly, Tesser was never really given a chance at Cagliari. Cellino, on the eve of the game, allegedly approached Tesser and said “let’s see if you are a lucky man.” This begs the question why Cellino employed Tesser in the first place, as such ominous works suggest Tesser was never going to last beyond his first defeat. Tesser moved to Ascoli for the start of the 2006-7 season but his fortunes failed to improve. 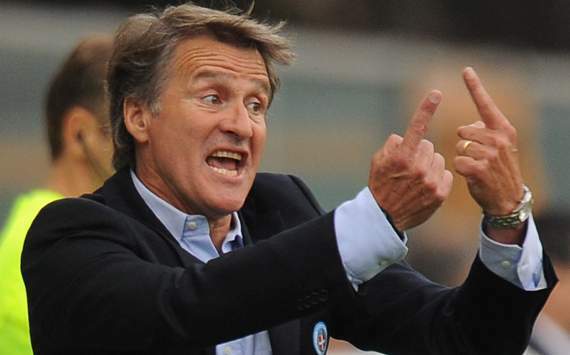 Ascoli sacked Tesser after the side collected just 4 points from their first 11 games. Though his record was poor, Tesser was once again a victim of bad lucky. In one game, for example, Ascoli were leading Roma 2-1 going into stoppage time. Roma scored a goal in the 92nd minute that was clearly offside, but the goal was given and the match finish 2-2. Perhaps Tesser would’ve turned things around if he’d been given more time, but his replacement Nedo Sonnets hardly fared better and Ascoli were relegated from Serie A. His reputation tainted after failures at Triestina, Cagliari and Ascoli, Tesser endured a brief period in the managerial wilderness before joining Serie B side Mantova for the 2007-8 season. Mantova finished 8th the year before and made it perfectly clear that promotion was their goal. Mantova started brightly under Tesser but it wasn’t to last. Tesser was dismissed in February 2008 with Mantova 7th in the league and seven points from a play-off place. It looked increasingly like Mantova would miss-out on promotion that season, but perhaps they should’ve retained Tesser’s services: they finished 9th without him. Tesser would again have to drop down the leagues for his next job. It came in 2009 with Lega Pro Prima Divisione side Padova, but again Tesser’s employment was short-lived. Padova won four points in five games with Tesser at the helm, but he was sacked after just a month and a half. Pretty depressing story so far, right? At this point I can’t help but feel sorry for Tesser. He had to cope without his best players at Triestina, was barely given a chance at Padova and Cagliari, and his time at Mantova wasn’t exactly disastrous. Aside from his poor Ascoli record, Tesser has been very unfortunate. I’m surprised he didn’t contemplate retirement after such a disappointing spell, but the man from Montebelluna finally got his break in 2009. Novara’s first season under Tesser was a great success. The Biancoazzurri were promoted from the Lega Pro Prima Divisione with four games to spare and were eventually crowned champions. Their promotion ended a spell of over 30 years away from Italy’s top two tiers, and Tesser was rightly hailed as a hero for the work he’d done. Ex-Inter Milan striker Nicola Ventola played a key role in Novara’s promotion push. Signed by Tesser in the second-half of the season, it was Ventola’s brace that secured a 3-3 draw with Cremonese and promotion back to Serie B. Ventola sadly went on to endure a series of serious injuries that would eventually end his career, but his contribution to Novara’s rise will never be forgotten. Novara started the 2010-11 unfancied and favourites for relegation. This was Tesser’s opportunity to prove himself: he’d already shown his abilities in the lower leagues, but previous spells in Serie A and B had hardly been kind to him. Amazingly Novara finished 3rd and defeated Reggina, who finished 6th, in a two-leg promotion play-off final. Tesser’s Novara had finally returned to Serie A after a 55-year absence, and they’d done it with a swashbuckling brand of attacking football that was as exciting as it was effective. Keeping Novara up will be the sternest test of Tesser’s managerial ability thus far, but whatever happens you’d think he’d done enough to earn a long stay at the Stadio Piola. Novara are a tiny club unaccustomed to playing at the highest level, and they’re back in the top flight thanks to Tesser’s assured management. Their squad lacks an all-out goalscorer and they’re favourites for relegation, but Tesser’s job will surely be safe even if they are relegated. Guiding any team to two consecutive promotions is no mean feat, let alone a club of Novara’s small stature and minuscule budget. For now, Tesser has the task of keeping Novara in Serie A ahead of him. He’s been run through the mill countless times, but now he’s at the helm of a Serie A side and has played a big role in one of calcio’s great resurgence stories. Here’s to Attilio Tesser and Novara Calcio.